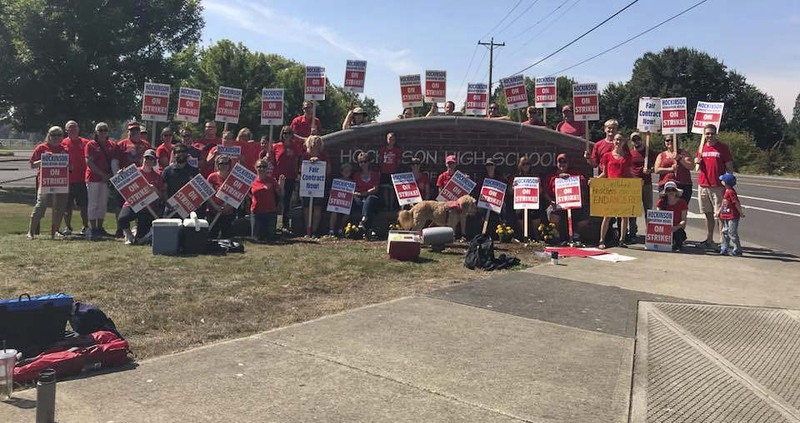 Evergreen teachers are still under contract through this school year, but are negotiating a salary increase based on the additional funding sent through the McCleary funding bill. The district’s most recently posted offer would boost the average teacher salary to $79,393, which includes over $10,000 from local funding. A PERC mediator has requested that the district no longer post offers and counter-offers during negotiations. VSD hasn’t released updated information on proposed wages since Aug. 23. At that time they were proposing a a 14.9 percent improvement in average total compensation over two years and a 17.2 percent improvement over three years. That would have bumped the starting wage to $51,254 (a $6,593 increase) and the most experienced teachers could earn $99,404 (a $15,481 increase) by 2020-21. The Vancouver Education Association, on their Facebook page claimed that they were due in court at 1 p.m. Thursday to fight an injunction against the teacher strike, but that over 900 statements signed by parents changed the district’s mind. District spokesperson Pat Nuzzo, in an email to ClarkCountyToday.com said only “VPS has not filed an injunction, nor do they plan to file an injunction tomorrow (Thursday).” The Vancouver School Board on Tuesday decided not to take action on a series of resolutions that could have cut off teachers from using sick leave during the strike without a doctor’s note. Superintendent Steve Webb released a statement saying state law will require them to stop paying teachers after Sept. 10 if a deal hasn’t been reached, and cut off healthcare premiums after Sept. 17. Battle Ground School District may remain the most far apart when it comes to a deal with teachers. They started off in June demanding a 25 percent pay increase. The district maintains that a loss of 44 percent of its local levy money leaves them with just 6.3 percent additional money to offer teachers this year. Their latest offer was a three-year deal the district says would increase teacher pay by 16.5 percent by 2020-2021, an average of $77,682. The district says it will meet with a mediator and BGEA representatives on Thursday, as well as a finance advisor from the Washington Education Association, but wanted to give parents time to prepare for the long Labor Day weekend. The Ridgefield School District has not officially announced that they will be closed the rest of the week, but the Ridgefield Education Association Facebook page says no new negotiations will be held until this Saturday. The district has offered a three-year deal for teachers that they say would boost average compensation by nearly $10,000 next year to $73,170. That would rise to $79,654 by the third year of the contract. The district says it remains hopeful that a deal can be reached with teachers before next Tuesday. Washougal is reportedly offering teachers a 16 percent raise, but teachers are pushing for more to put their compensation more closely in line with competing district nearby. The district and union met with a mediator until 2 a.m. on Wednesday morning, but were unable to reach a deal. The next bargaining session will be on Thursday. HSD says they have offered teachers what amounts to an 8 percent raise, bringing total compensation to an average of $74,463. The Hockinson Education Association proposal from Aug. 15 would amount to a 25 percent increase, or an average of $83,220. Right now teachers have authorized a strike if a deal isn’t reached in time, but that strike hasn’t officially begun.